This group of collected essays by the author of How To Get Filthy Rich in Rising Asia is minor-arcana, a small treat for the Mohsin Hamid fan, which I am. Hamid is one of the best writers of literary fiction working today. He knows what’s important in life and has an ability to access strong, deep human emotions in his fiction. He’s a humanist, and he’s also the type of sophisticated writer who achieves utter clarity and simplicity. In global world, we’re all foreigners somewhere, and all forced to contend with alien new neighbors—even if they live continents away. Hamid is an ideal guide to this strange modern condition. He’s Pakistani by birth but has lived only “a little less than half” of his life there. 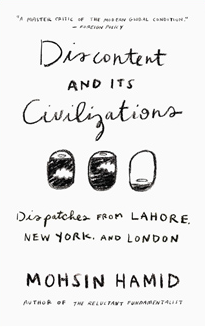 He lives in Lahore now, but spent much of his adult life in New York and London, the other two cities of the book’s subtitle. That he has these concerns—how to be human, how to be human together—is why I’m interested in him as a human, and why I’m curious to read his autobiographical essays and his thoughts on writing and politics, as collected here. I do find that work collected from previous mass-media sources can be dated and scattered, and this collection has that problem to some extent. Do we care about that time he saw Avatar in Lahore? How he likes Murakami’s running book? Still there’s enough wisdom in here to make those flaws easy to overlook. And as an American, reading the Politics section reminded me of how U.S politics have shaped Pakistan since its inception. We are neighbors. Wouldn’t it be nice if we could visit more freely with each other? One particularly wonderful thing that strikes me about this book you’re reviewing is its title: how marvelously topical and contemporary to reverse the previous famous title “Civilization and its Discontents,” a title which assumed an achievable world goal called “civilization,” which each country might reach, given time, and replace it with “Discontent and its Civilizations,” a title which assumes first and foremost the pluralism of different civilization models, all with some kind of discontent, discontent itself now becoming a universal!